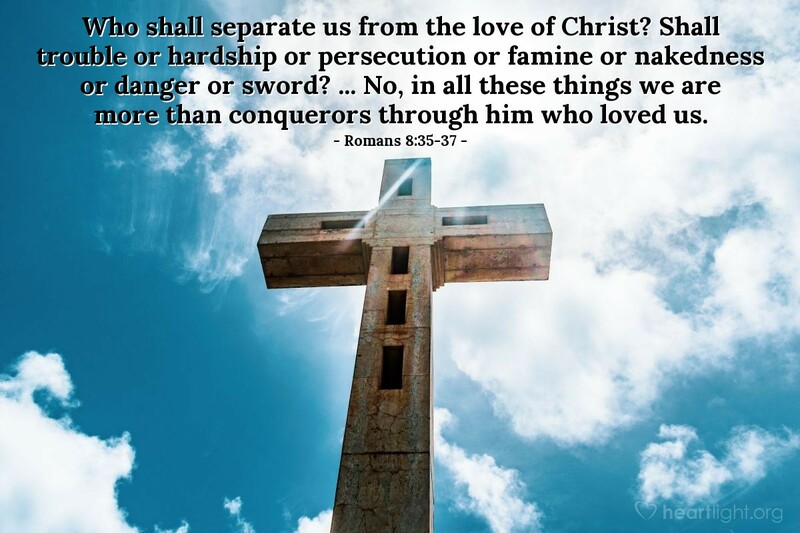 Who shall separate us from the love of Christ? Shall trouble or hardship or persecution or famine or nakedness or danger or sword? ... No, in all these things we are more than conquerors through him who loved us. More than conquerors! What a great phrase. In Christ, this is who we are: more than conquerors. No hardship, enemy, physical disaster, not even death, can separate us from Jesus. Once our lives are joined to Jesus, our future is tied to him (Col. 3:1-4). Almighty God, I do not know how to thank you enough. Thank you for the confidence I have in Jesus. Thank you for your gift of grace. Thank you for your indwelling Spirit. Thank you for your promises of heaven. Thank you for your love that has saved and remade me. Thank you for assuring me that I will never be alone no matter what I have to face. Most of all, dear LORD, thank you for knowing that nothing that can happen in this world has the power to strip me from Jesus' love. I look forward to forever with you. Thank you in Jesus' name. Amen.